The first work that I enjoyed was Gabriela Herman’s Crushable. This piece is intriguing to me in many ways. 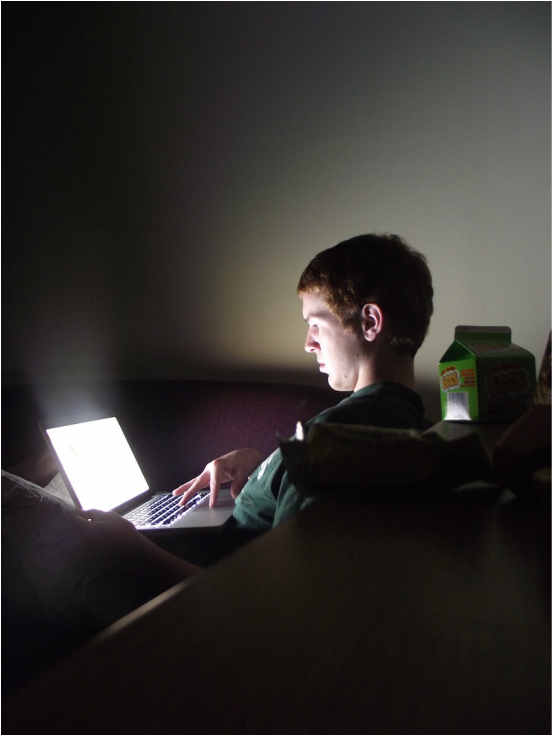 Like the other photographs in this series, the only light source is coming from the computer screen. It is this bright glow that seems to dissipate the farther away you get from the source and washes over all the surfaces. I particularly like how there is not a lot of real defined edges in the photograph, just areas of highlights and deep shadows. The edge of the couch do not exist, it just disappears into the darkness. The light also highlights on the surfaces of her face, the cheeks stand out and then shadows blend into her darker hair. The light creates softness to her skin and body. I also like that even though the light of a computer screen is usually bright and a harsh, blue light, the back wall of the room remains this warm orange color. The couch appears a vibrant red as well. These colors compliment the bright blue that seems to radiating from her headband. The intensity of the blue caught my attention and is one of the first things I see when I look at this photograph. I enjoyed this photograph and this series of work because I think it represents us very well in this modern day and how we use technology. I think it shows how we always seem to become absorbed by technology in some way, whether it’s checking emails, Facebook, or reading and writing a blog. As soon as we log in, or open up a browser we automatically fall into our own little world. What matters most to us for that moment is what’s on the screen in front of us, the world around us seems to come to a stand still. It is so easy to lose ourselves in social media and on the web, and technology is making these experiences more exciting than ever before, we can interact with innumerable people without even leaving the comfort of our living room. I think that is what this photograph, and others in the series are showing. The second work that I enjoyed was part of Dina Litovsky’s Un-tag This Photo series. In this photo we see a group of people through the legs of a girl who is standing on a table or bar. At first glance I actually look to the girl who is standing in the middle of the photograph wearing the gold dress. Her expression is interesting to me. She seems to realize that amongst the wildness of the party, the camera is on her. So naturally she looks at it! The couple on the right seems to be having on of those, “uggh look at her” moments or “can you believe that guy?” On of the reasons why I enjoyed this photograph is that there are multiple things happening all at once. The guy on the left maybe is eyeing someone across the room. For some reason through all of this, no one is looking at the girl who is standing on the bar. A little odd, but when looking at the photograph myself, I seem to see right through her legs and into the background. Something I find interesting about this photo is the use of a foreground object to frame the middle ground and background. However, they do not overwhelm the photo and do not stand out that much above any of the other subjects. My eyes constantly move back and forth throughout the photo. The girl’s legs almost divide the photo into thirds, something that is pleasing from a compositional and aesthetic point of view as well. This photograph makes the viewer wonder a lot, questions pop into my mind about what is going on, why is she up there? I think that part of this comes from the setting and context of these photos. It’s a bar where people seem to be showcasing themselves more and more. We are meant to wonder, our attention is called to them because they want it to be. These are the questions they want us to think. I like this photo because at first you think I would never do something like that, but then you begin to wonder what would you do if you knew everyone around you you’d never see again and it didn’t matter what others thought? It makes us think about what are our boundaries, but also lets us into the wilder side of our lives. My Visual Response is a recreation of one of Gabriella Herman's photos. It was interesting to see the affects with no ambient light besides the computer screen, and if there was another small light source. I also tried to use the table, to set up a foreground. The subject becomes the middle ground and the wall the background. This gives the photograph some depth.